Title: 'Candia [and] Insula Candia olim Creta', Amsterdam: c. 1680. Engraved with full period colour. 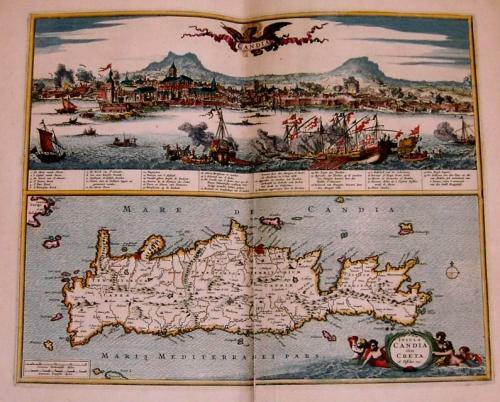 The island of Crete was taken by the Venetians during the Fourth Crusade in 1204. The Venetians installed a Duke in Candia, and the whole island came to be called Candia. In 1669, the Turks completed a conquest of all but two fortresses which held out until 1715, constituting the longest siege in history. Pictured in the view of Candia is what appears to be an attempted relief mission by the Knights of Malta, in which the Knights are bombarding the beseiging Turks. Ref: Koeman, v. III, page 180. The map is in excellent condition with no discernible faults except for some minor foxing well away from the papers edge and a 10 cm tear at the bottom centrefold.